LIGONIER — The Ligonier Public Library, now in its 103rd year of operation, is looking to expand and needs the public’s help in securing a grant to help pay for a possible new addition, or renovation project. “We have ran out of space to grow in,” library director Jerry Nesbitt said this week. “Our shelves are full to bursting, our computer rooms are full, and we have a lack of space for meetings and programs. The library is asking for letters of support from the community, to accompany its request for a Community Focus Grant on the possibility of an expansion or renovation. “The more letters of encouragement we receive, the better the chance for us to get the grant,” Nesbitt said. Letters should be concise about why patrons believe the library needs to expand or renovate, and should also include the writers’ positive feelings about the library, Nesbitt said. The letters can be sent by email or by U.S. mail. If mailing out a physical copy, residents should use their actual signature to sign it with their printed name below. The library is using a consultant, Robert Murphy, to apply for the grant. Or they can be mailed or dropped off to the Ligonier Public Library, 300 S. Main St., Ligonier, IN 46767. LIGONIER — Many improvements have come to Ligonier’s downtown area over the past five years, but community leaders are not content to sit back and be satisfied that their work is done. City officials and a large corps of volunteers are working to do more to enhance the city’s viability for business and tourism. 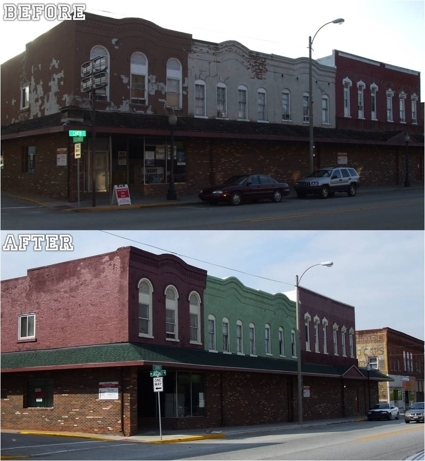 Those improvements, including the addition of nearly two dozen large murals on the exteriors of buildings along or near Cavin Street, the city’s main downtown business route. 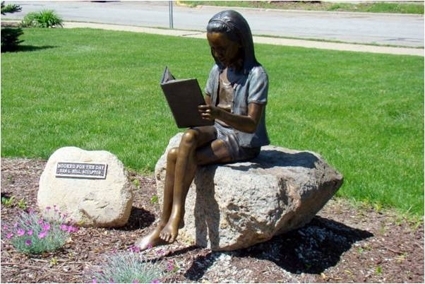 Beautiful, expensive bronze statues have been donated to the city and one large, former eyesore building has been razed in order for a new park to be built on the site. 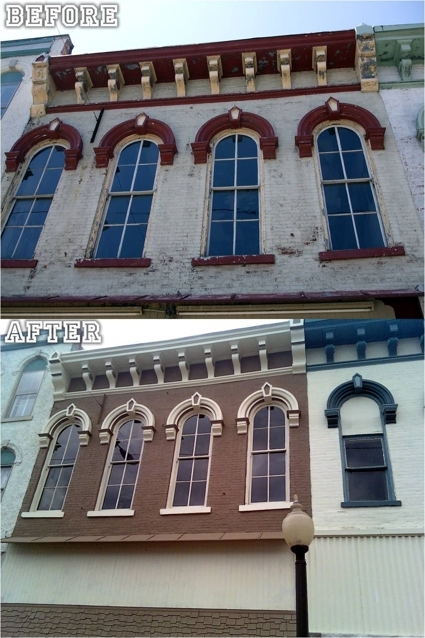 Dozens of buildings have been painted and many old signs and decaying facades repaired along Cavin Street. And almost 100 percent of these improvements have come from the work of volunteers, or through grants from foundations or donations by individuals and businesses. But now the city is looking to move forward in the revitalization of the downtown area. Tuesday night, one of the first steps was taken when the Future Ligonier Alliance (FLA) hosted a seminar on Ligonier’s role as a member of the Indiana Main Street program. 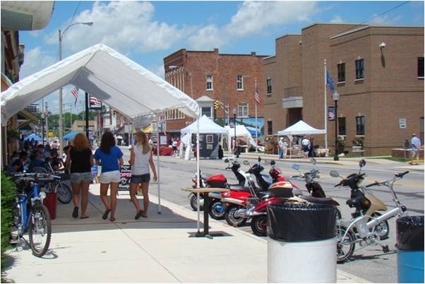 It’s a nationwide effort to help America’s cities and towns preserve their Main Street heritage and make improvements. John Bry, executive director of the Noble County Visitor’s Bureau, was the featured speaker at Tuesday’s seminar, “Downtown 101,” which attracted about 70 people to the Ligonier United Methodist Church. Bry, who has extensive experience working with communities and their Main Street efforts, spoke for nearly two hours on ways in which other small cities have helped to make improvements. Bry also addressed specific issues pertaining to Ligonier, including what has been done in the past and what can be done in the future to keep the downtown area fresh and strong. 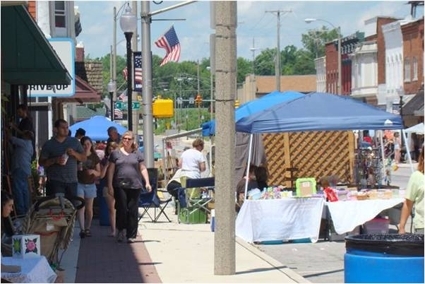 Bry is helping other cities and towns in Noble County with their downtown revitalization efforts, and said the work being done here is attracting attention in Indianapolis. Noble County’s communities, he noted, by working together, can accomplish much greater things than individual efforts. Bry has made similar presentations to other communities in the county and more are planned. Bry outlined his history in dealing with other locations including Flora, Ill., and Urbana, Ohio. Ligonier, he said, has made great strides in the past several years. “You are ahead of many other cities already,” he said. He said the city’s mural program, statues, banners and flags, as well as the improvements made by Operation Foundation have attracted a lot of attention in other parts of the state. Bry urges cities to take a four-step approach as outlined by the Main Street organization. Those four steps are design, organization, promotion and economics. Downtown revitalization, he warned, does not mean trying to turn business districts back to the way they were in the 1950s or 60s. “Adaptability” is the keyword to success in the 21st century, according to Bry. Ligonier and other communities must work on partnerships, network and sharing of resources with other communities that have the same goals as well as the same problems. Tuesday night’s meeting was the first step in the next phase of Ligonier’s efforts to bring more business and tourism to its downtown area. While good things have happened in the last half-decade and great things can be accomplished in the future, it’s going to take hard work and determination for Ligonier, or any city in Noble County, to make its downtown district even stronger and more vibrant, Bry told his audience. 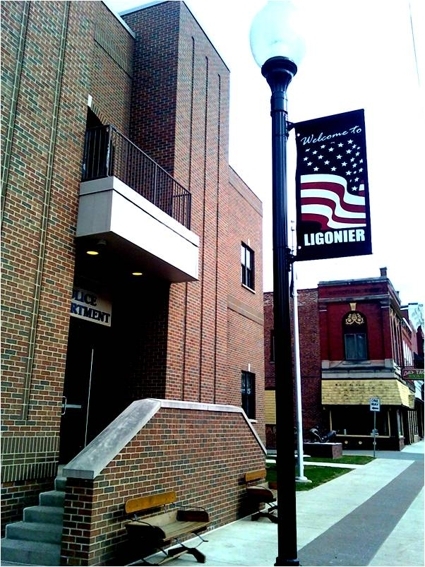 The Future Ligonier Alliance, sponsor of Bry’s appearance in Ligonier, along with Operation Foundation, is taking the lead in working with city officials to make improvements to the city. It’s an all-volunteer grassroots organization that will continue to do all it can to bring more tourist dollars to Ligonier, according to Mark Furkis, current president of the FLA.
LIGONIER - After last night's city council meeting, Mayor Patty Fisel unveiled plans for the former Essex Wire property. The project is being paid for in part by grants from the Jennie Thompson Foundation and the Hagen Family Foundation in Ligonier along with funds from the Ligonier Redevelopment Commission. The decrepit building was donated to the city by the Pettit Family who had owned the property for the last several decades. 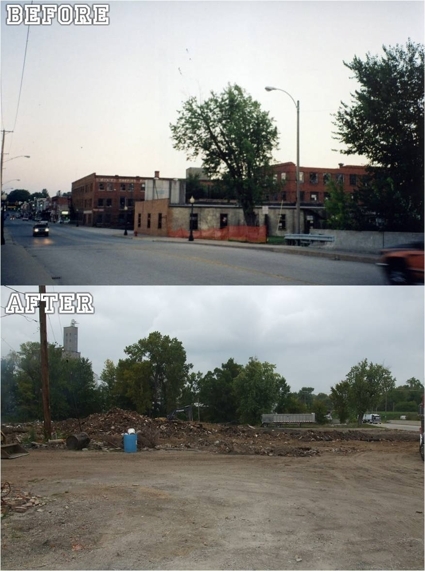 The city was responsible for the demolition of the building which quickly transformed into the largest recycling project in the State of Indiana, being used as a model for future Brownfield demolitions across the state. 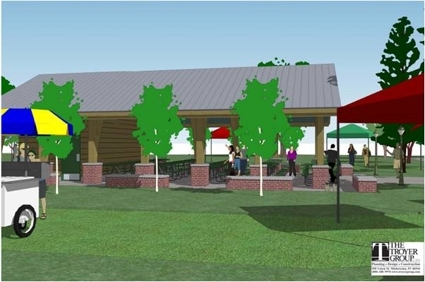 Plans call for a large pavillion that could be used for a farmer's market, educational events, or small concerts and community events. The pavillion will be equipped with men's and women's restrooms and is designed to complement the historic architecture downtown. 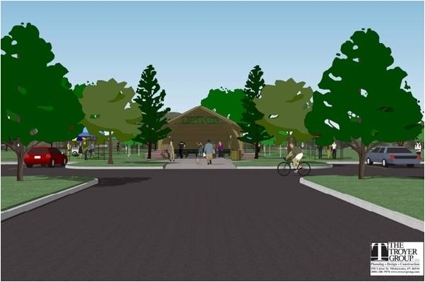 The park will be a welcome addition to the many other improvements downtown including 20 larger than life murals, 5 life-size bronze sculptures, and the one mile Elkhart Riverwalk which is currently under development. 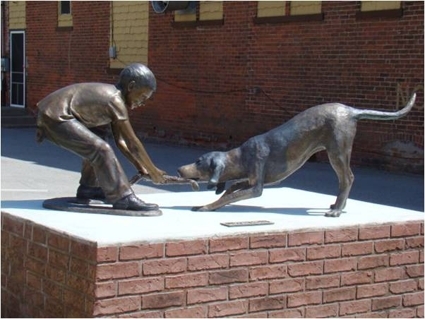 LIGONIER - Located throughout various parts of the city of Ligonier are 5 life size bronze statues which were donated by two individuals. 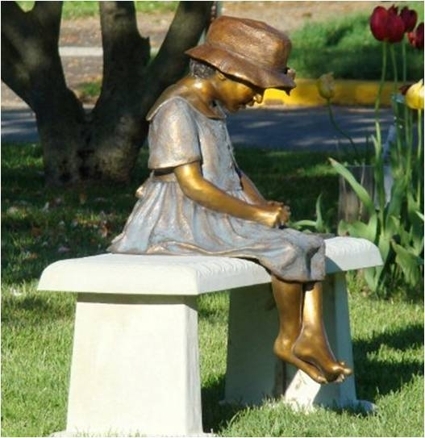 The donor of one of the statues is Gene Alber who donated the statue in memory of her husband. 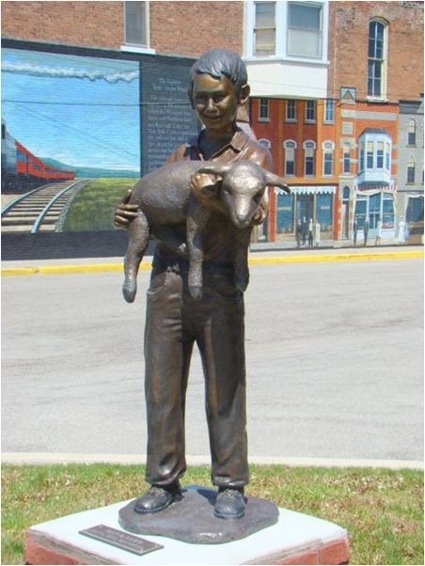 The other four statues were also donated to the city and that person chooses to remain anonymous. Here are some photos in case you hve not had the opportunity to see them in person. LIGONIER - While bittersweet in the fact that a small piece of history has been lost, the dilapidated old Essex Wire Building has been demolished. The land is now ready to be transformed into a riverside park which will be the perfect addition to the one mile riverwalk which is still being developed along the Elkhart River. LIGONIER - Be sure to drive through Ligonier and see all of the great changes that have taken place this past week during the third annual Operation Foundation work week. 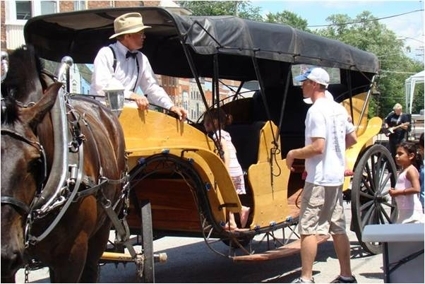 This year, nearly 600 volunteers descended on Ligonier's downtown and surrounding residential areas. Take a look! What is America in Bloom®? LIGONIER - On Monday July 7th, two judges representing the America in Bloom contest met with several members of the local government and community leaders to meet each other and review the agenda for the 2 day visit. Bill Hahn and Leslie Crowl, both from Ohio, were the judges that were sent to survey the city. Each judge has had several years of experience not only in judging city criteria, but also began their experience with AIB by participating with their home town in the contest. Bill and Leslie were both very excited to be in Ligonier to see what our community is doing to promote a solid community foundation and quality of life. 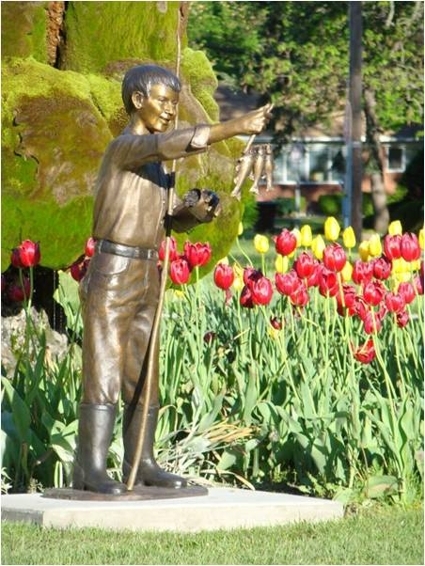 The criteria that the judges evaluate a city on are much more than flowers and landscaping as the name America in Bloom would suggest. 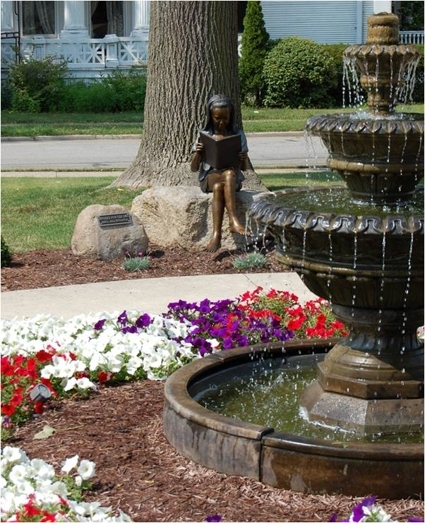 The criteria are: Heritage Preservation, Tidiness, Community Involvement, Floral Display, Landscaped Areas, Sod & Groundcover Areas, Urban Forestry and Environmental Awareness. Our goal for this participation was to have someone from the outside of our community come and compare us to other communities of similar size and give us recommendations of what we are doing well and areas that we needed to work on. Throughout the two day visit the judges were introduced to: City government officials; past, present and future city projects; Jenny Thompson Gardens; Ligonier Library; Operation Foundation; Discovery Express; Ligonier Police; Ligonier Fire; Future Ligonier Alliance; Radio Museum; Ligonier Historical Society; Ligonier Water Dept; Ligonier Waste Water Treatment; Stone’s Trace Historical Society; Ligonier Parks and a driving tour of the entire community. There was so much to show Bill and Leslie that we ran out of time or had to cut short several discussions of these areas and several more. I want to thank everyone involved with this visit. Without the support of each person, this visit would never have been received as well as it was. Thank you so much for each of your efforts. I am so proud of all the people that participated in this visit. We have some of the most dedicated and visionary people in this community that I have ever seen gathered for one goal – the improvement of the quality of life for the citizens of Ligonier. Everyone should know that these judges were absolutely amazed at the things this city and its citizens are doing. Monday night Bill and Leslie were presented Operation Foundation and what its goals are for our community. This meeting was inspirational to everyone that attended. Bill gave such wonderful words of encouragement to the foundation building movement that Operation Foundation is doing. 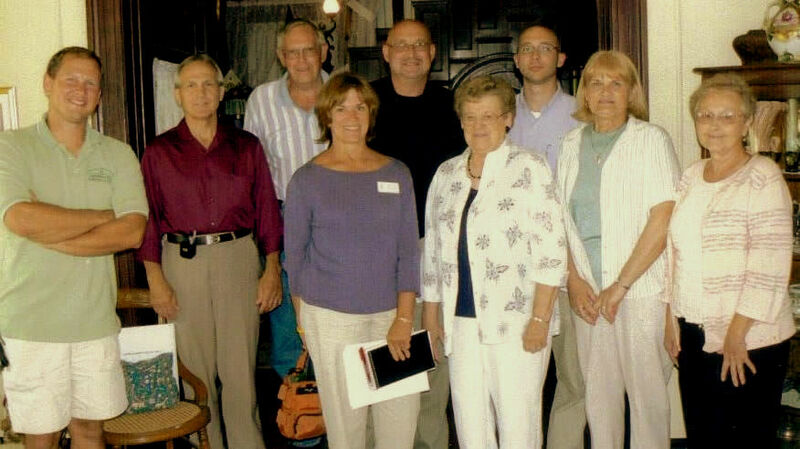 No other city that they have seen our size has such a dedicated volunteer group as Ligonier does. From this meeting we were asked to present Operation Foundation to the National Convention of America in Bloom held the first weekend of October in Columbus Ohio. What an honor this is for a new participant in this contest. I would like to make a personal Thank You to the groups and individuals that made this possible. Without the support of groups and people like these, our vision for the future would not be as bright. Thank you. LIGONIER - A drive through downtown Ligonier will reveal our all new roadside banners. The funds were secured last fall through a grant from the Noble County Community Foundation and installed last week by Jerry Donley, President of the Future Ligonier Alliance. LIGONIER - The face of downtown Ligonier continues to improve, with the addition of Ligonier's second outdoor wall mural. Located at the rear of Dr. Richard and Peter Brown's Dental office, (Across from the Ligonier Fire Department) the scene depicts a visual history of Ligonier dentistry. Dentists from the past and present are honored with plaques indicating their years of service to the Ligonier community. These plaques surround an image of a 19th century waiting room which contrasts with a present day image. This is the second of a series of murals planned for downtown Ligonier, thanks to the efforts of the Future Ligonier Alliance, a community-improvement group. 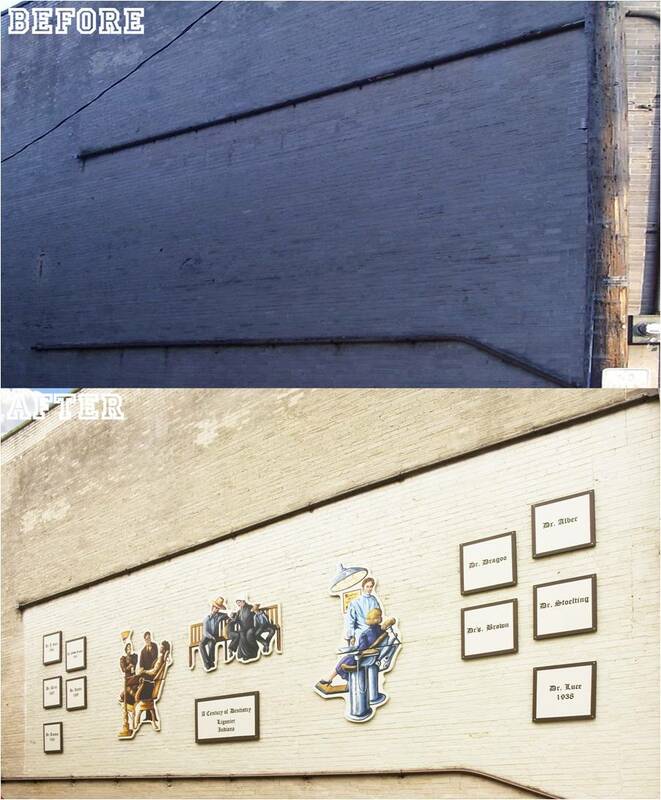 Grants have been secured and at least four more murals will be placed by the end of 2008. LIGONIER - One of the most valuable assets in downtown Ligonier, the Elkhart River, will soon see some drastic improvements thanks to the efforts of the Future Ligonier Alliance and Operation Foundation. Ligonier's first riverwalk will consist of a one mile walking path connecting Woodlawn Park at Bridge Street to the future site of Discovery Express in downtown Ligonier. 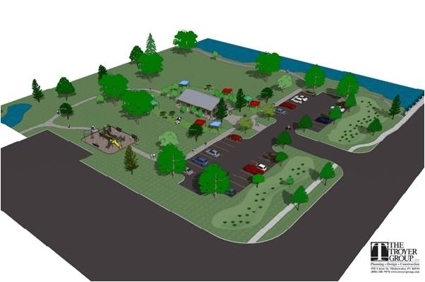 The walkway will be constructed by various organizations who have agreed to adopt 500 feet each, and will take advantage of beautiful scenic views as well as open green space on the former Essex Wire property. If you are interested in helping with this project, please contact Wayne Fox, Ligonier Building Commissioner at wfox@ligonier-in.org. 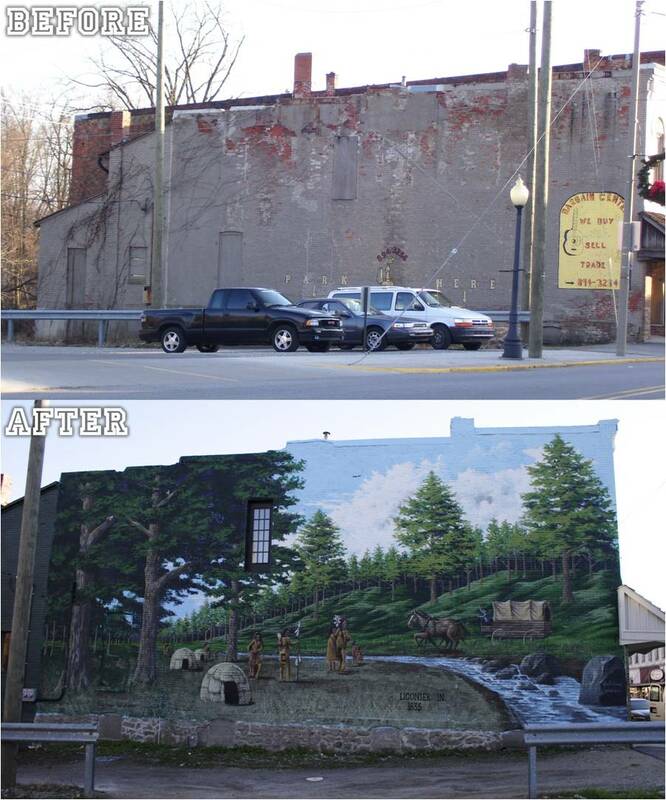 LIGONIER - The face of downtown Ligonier continues to improve, thanks to the artistic talent of Robert Hudson from Winona Lake. Hudson is painting this large mural on the side of the building at the north end of downtown Ligonier. The scene depicts Ligonier as it may have appeared when it was founded in 1835 by Isaac Cavin. The mural is the first of several planned for downtown Ligonier, thanks to the efforts of the Future Ligonier Alliance, a community-improvement group. Grants have been secured and at least five more murals will be placed by the spring of 2008.
click hereto view photos of various Ligonier landmarks. related linksclick hereto see some of our partnering clubs and organizations.